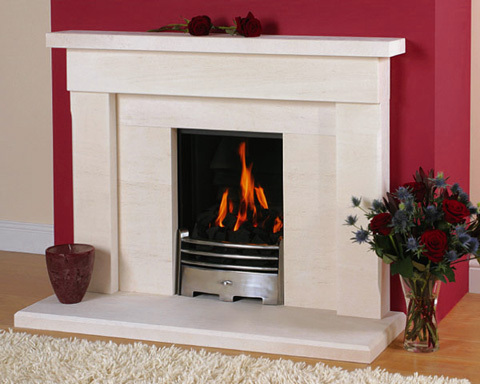 Beautifully hand finished natural Portuguese Limestone Recommended for most compatible gas flues and electric fires Not suitable for solid fuel Available 48" and 54" Gas fire not included We will be happy to advise you, please contact us Price on Application Why do we not sell this product on-line..??? ?Firesurrounds are fragile until they are installed onto a wall, permanently. They have to be handled with great care as they will chip very easily. Many surrounds come in numerous parts and some are extremely heavy. We use two expert fitters for most of our installations, only rarely do we use one fitter. We have tried sending firesurrounds by carriers on pallets, but despite our best efforts of packaging many still arrive damaged, in fact some have arrived as a pile of rubble (most disconcerting to the customer and us). We soon realised this was a recipe for disaster and no longer do it. All the manufacturers who we buy our firesurrounds from deliver their products on their own transport direct to our premises, with experienced people to handle the products. They do not use carriers. If you live up to 30 miles from our showroom we may be able to deliver direct to you on our own van, or if you can pick up from us we will help load it, but you must have a van and lots of packaging. The internet with its online selling is great for many things but having had our fingers severely burnt, fireplaces in our opinion are definitely not one of them. You have been warned !